For months we’ve heard rumours that Apple is on the brink of launching its first mobile health product. Known as HealthBook it’s tipped to track everything from sleep to fitness to hydration and given Apple’s current hold over the smartphone market it could be game-changing. Earlier this week, Apple fans at 9to5 Mac published a really detailed rundown of many of HealthBook’s key features, which prove it could well be the app that forces mobile health well and truly into the mainstream. According to 9to5 Mac, the app will include a number of different cards all contained within the “book”. 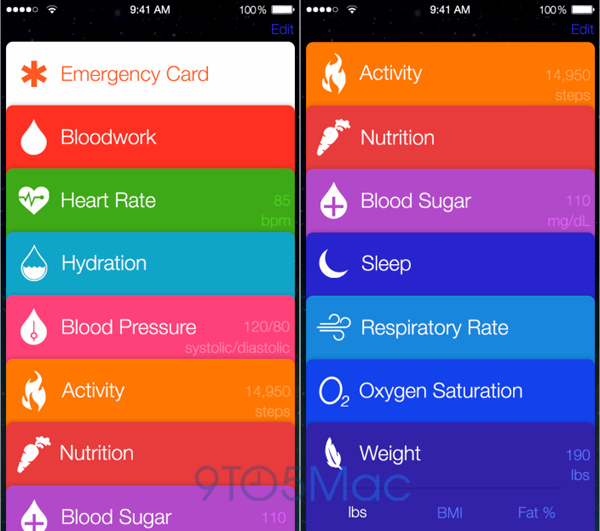 Each card represents a different area of your health, and from the screenshots it looks like all kinds of areas will be covered, including bloodwork, heart rate, hydration, activity, nutrition, sleep, blood sugar and much, much more. If these screenshots are part of a yet-to-be-released app (and not redundant or awaiting much more tinkering), then it looks like Apple could bring all of the experiences we’re slowly getting used to with other apps and products into one handy hub. It’s not clear whether third party apps or devices will feed into the HealthBook, but it would seem necessary to gather such comprehensive data – unless Apple has a line of hardware up its sleeve too of course. Many are already worried this could signal the death of every other mobile health app out there, but it could actually lead to even more validation for the health and fitness tracking industry. You can check out the full post on 9to5 Mac here for more screenshots, speculations about the data collected and rumours about its launch.